In The New York Area? Check Out NYPUG's First Meeting! Windows Phone 7 is one of the hottest topics floating around the net right now, and what better time to learn more about it than November 15 at the New York Windows Phone User Group (NYPUG) Meeting! This new group, which will be meeting regularly, is holding it's first meeting on the evening of November 15 (Monday) in Midtown Manhattan and you're invited! We've got a few short presentations, lots of time for Q&A, and more planned (Even a few giveaways), so be sure to register today at http://bit.ly/nypug1. A great time is guaranteed for all! 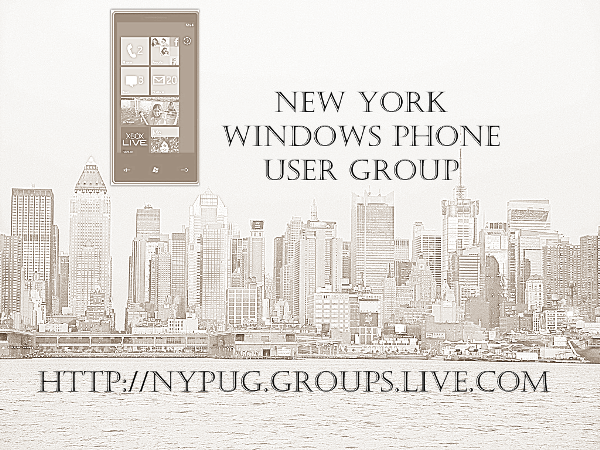 I'm really psyched to announce the first meeting of the New York Windows Phone User Group (NYPUG), open to anyone within a reasonable distance of NYC who wants to meet up, talk about phones, and learn about Windows Phone 7. Why am I psyched? Because I'm the one leading the group, along with fellow MVPs Johan van Mierlo, Adam Z. Lein, and Eric Hicks. Our First Meeting will be on Monday, November 15, starting around 6:30 with presentations starting around 7:30. We've scored some space courtesy of the local Microsoft office in New York, right in midtown Manhattan in the AXA Building (6th Ave, between 51st and 52nd). Space isn't limited, but registration is required, so if you're looking for a good time, perhaps some food (if we can arrange it) and a place to talk Windows Phone, head on over here to register and/or join our Live Group here. Totaly off-topic: I read that as New York Palm User Group. If New York wasn't so far away from me, I'd drop in and say hello. Have fun everyone! That's why I said a bit closer. Not to mention the fact it seemed like an easy way to get a plug in for the guys in Toronto. The extended family keeps growing! I run the Windows Phone User Group in London! We're having our 4th meeting on Nov30th.